Just 500m from the exit of one of the most commonly used motorways in France and close to some of the most popular tourist attractions in the southern Yonne region, La Grange de Marie is a 2-star hotel in one of the most popular regions in France. La Grange de Marie is 500m from the centre of Nitry and 17km from Chablis. With grounds spanning 1.5 hectares, you can enjoy a breath of fresh air and the total peace and quiet of the surrounding forest. Near the vineyards of Auxerre and Tonnerre, the medieval village of Noyers-sur-Serein, the châteaux of Tanlay, Ancy-le-Franc, Saint-Fargeau and Guédelon, Vézelay and its basilica and Auxerre’s churches and ancient town, La Grange de Marie is a great starting point for sightseeing. Plenty of journeys between Paris and Lyon and the North and the South pass through Nitry. This contemporary hotel offers high-quality facilities and services: satellite TV, Wi-Fi, 24-hour reception area and a huge private car park, away from it all in the Burgundy countryside. In the heart of the village, a former priory building is now home to L’Auberge de la Beursaudière, a restaurant offering delicious regional specialities. Our hotel is just a few minutes from Chablis: the ideal location for business travel. 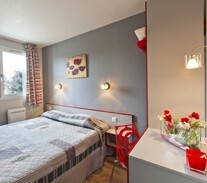 Organise your overnight stopovers for business trips at La Grange de Marie.